Nanjing Road is the main shopping street of Shanghai, China, and is one of the world's busiest shopping streets. Today's Nanjing Road comprises two sections, Nanjing Road East and Nanjing Road West. In some contexts, "Nanjing Road" refers only to what was pre-1945 Nanjing Road, today's Nanjing Road East, which is largely pedestrianised. Prior to 1949, the road's English name was rendered "Nanking Road" using the standard romanization of the time. Nanjing Road is located in the city center, running in a west-east direction. Its eastern section is in Huangpu District and extends from The Bund west to People's Square. The western section begins at People's Square and continues westward towards Jing'an District. 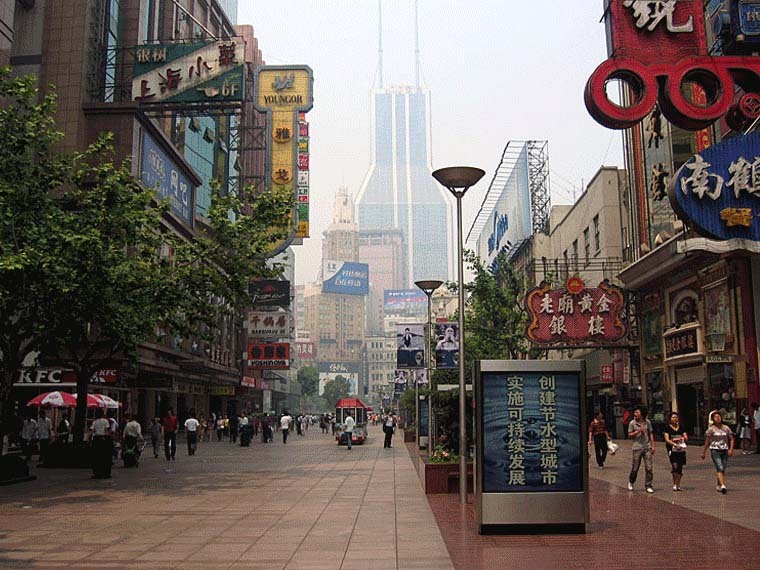 The entirety of Nanjing Road has been a centre of commerce in Shanghai for more than a century. East Nanjing Road is a dedicated commercial zone. At its eastern end is the central section of the Bund, featuring the Peace Hotel. Immediately west of the Bund precinct was traditionally the hub of European-style restaurants and cafes, although in recent years these have become less of a feature as the demographics of visitors to Nanjing Road have shifted from affluent local residents to visitors from around the country. Close by is the Central Market, a century-old outdoor market today specialising in electronic components and digital media. Further west is the Nanjing Road pedestrian mall. Located here are most of Shanghai's oldest and largest department stores, as well as a variety of domestic retail outlets, and some traditional eateries with a long history. The pedestrian mall, and East Nanjing Road, ends at People's Park, formerly the Shanghai Race Course. Opposite the park are located some of Shanghai's most prestigious historical hotels, including Park Hotel. West Nanjing Road begins here, and features a number of upmarket shopping centres, office buildings, the Shanghai Exhibition Centre, and retail. This area also previously featured a number of large mansions and estates, most of which are today either demolished or used by the government. Nanjing Road is the world's longest shopping district, around 6 km long, and attracts over 1 million visitors daily.